Every Christmas I like to make something as a gift for family and friends. Something thoughtful, festive, homemade and most of all delicious. It might be a jar of homemade plum jam taken from a recipe from my grandma, or a batch of sweet tomato chutney perfect to accompany a Christmas ham. 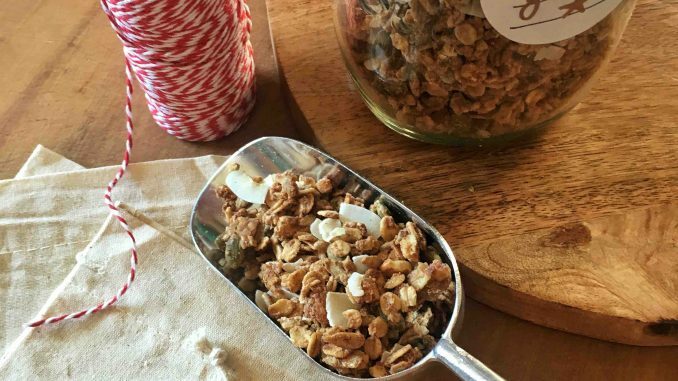 This year though, I’m baking this wonderfully aromatic, spiced granola — a lovely, wholesome breakfast or snack that is reminiscent of Christmas with its sweet maple and cinnamon glaze. I’ll be decorating mine by wrapping it in a calico bag with a natural twine tie and simple gift tag, a perfect little thoughtful gift for loved ones, special teachers, neighbours and friends, but it would also look gorgeous in a recycled jar with a chalkboard label! In a small saucepan, mix together the maple syrup, peanut butter and vanilla to create glaze. Stir constantly over a low heat until combined. Remove from the heat and allow to cool. In a bowl, combine the oats, coconut, pumpkin seeds, almonds, cinnamon and salt. Mix well. Pour the cooled glaze over the dry ingredients and mix well. Lie a baking tray with greaseproof paper and spread the granola evenly in a thin layer. Bake for 10 minutes. Remove the granola from the oven, stir gently to ensure baking is even, and return to the oven for a further 5-10 minutes but watch closely as it can burn easily. Remove from the oven when golden brown and cool completely. Once cooled, store in an airtight jar and serve with Greek yoghurt and berries.